H.E Lina Annab is the Minister of Tourism and Antiquities of the Hashemite Kingdom of Jordan. Prior to assuming her ministerial post in June 2016 Minister Annab was the general manager of Zara Investment Company (Holding). She was also a member of the board of directors of various private and public shareholding companies in Jordan. She represented the private sector on the "Employment –Technical Vocational and Education Training Council (E-TVET Council)". She was a member of a number of selections and judging panels for renowned awards and fellowships in entrepreneurship and leadership. 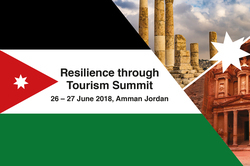 Until recently, HE represented the private sector on the Board of Directors of Jordan Tourism Board (JTB) as well as on the "Economic and Social Council". Over the past 20 years, Minister Annab held various positions at Citibank, Johnson &Johnson, and the International Monetary Fund. Her Career covers product management, research, marketing, and Finance. Throughout her career she has worked in the USA, Europe, and Various countries within the Middle East. Minister Annab holds a Master of Arts degree in International Affairs from Georgetown University in Washington D.C. She also holds a Bachelor of Arts degree in Political Economy and Foreign Languages and Literature.